Community groups in Brighouse are gearing up for the Tour de Yorkshire as it comes through the town for the first time. 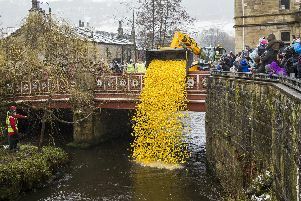 Incredible Edible Brighouse has begun preparations to get Brighouse ready to welcome the Tour de Yorkshire next month. The Tour de Yorkshire will be passing through the town on Sunday April 30 and will link in with the annual spring market held by the Brighouse Business Initiative. Liz Kenny from Incredible Edible said preparations are well underway to add some colour in the town centre for the proceedings. “The group has started tidying up the raised beds in the town centre, the daffodils are growing well and will soon bring a welcome splash of colour to the town centre. “These will be followed by edible plants such as strawberries, onions, kale, and a variety of herbs which when fully grown can be harvested by members of the community. The group has also been transforming the roundabout in Thornton Square with a new planting scheme. The roundabout will feature a land art installation for the Tour de Yorkshire featuring Forget-Me-Not Children’s Hospice which is the logo of the Alzheimer’s Society. “We would welcome new volunteers, donations of timber to create raised planters, any spare plants particularly fruit and veg, anything we can sell on our stall to raise funds for materials,” added Liz. The timings have also been released for when the cyclists will be heading through Calderdale (see pages eight and nine). The Leader of Calderdale Council, Councillor Tim Swift, said: It’s great that the timings for the Tour de Yorkshire have now been announced, allowing people to start planning their day and deciding where to watch to get the best out of the race. The Calderdale section of the route is due to be quite a spectacle, especially with the challenging terrain of the Côte de Shibden wall. The Tour de Yorkshire was launched in 2015 to extend the legacy of the 2014 Grand Départ. The men’s race is a three-day event from April 28 to 30.